I’ve just read a good swath of the New 52 Catwoman, written by Ann Nocenti, drawn by Rafa Sandoval, Jordi Tarragona, Patrick Olliffe, and Tom Nguyen. Isn’t that kind of uncomfortable? On the plus side: it’s very well drawn. I prefer the more minimalist line of Darwyn Cooke, but I can’t complain about the art (as I did with Hellblazer), especially Sandoval’s. Well, actually I can: I like the way the artists design the whole page, and yet they don’t make a pleasing whole in the way that J.H. Williams can do effortlessly, and they rarely offer the sense of wonder offered by John Cassaday. Plus it kind of bugs me that the artists think people can talk with their mouths closed. As for the stories— I dunno, they’re grim and ultraviolent (autocorrect wants me to say ultraviolet) without any concession to realism. 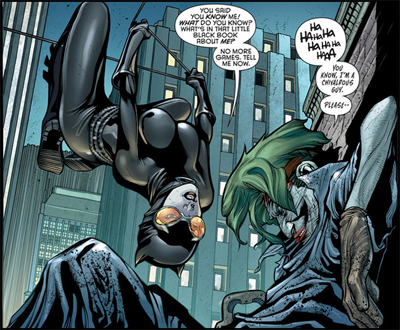 Nocenti’s Catwoman is a little more immoral, more of a loner, than before the New 52. More like Batman, then, but that doesn’t feel like a good move for her— her greater empathy and real concern for the East End were solid pluses. Gotham City requires a weird balance too. Batman grew out of noir, and his enemies are goth exaggerations of ’30s gangsters. I think Catwoman works best when she’s planning an elaborate heist, or confronting the gangs directly. E.g. there’s a pretty good arc where Penguin sends drone bombs after her, and she directs them back at him. It’s always fun to see Penguin going in a few seconds from arrogant to sniveling when his bodyguards are stripped away. There’s at least a little grounding in reality here— the book doesn’t have anything to say about gangsters, but at least they’re based on something real. Well, Big Comics has to fill dozens of titles every month, and it’s hard to have good ideas each time. But I wonder if grimdark isn’t a little played out. Gangsters and psychopaths are powerful narrative elements, but they don’t constitute an injection of realism any more— quite the opposite, Gotham City’s villains have just been banging around inside their own lurid bubble for eighty years. I don’t have any bright ideas on how to fix it, except to suggest that the most satisfying Catwoman stories tend to be those that downplay the supervillains entirely, and make use of her intelligence and social skills.